Marking the 30th anniversary of the launch of Warrior earlier this year, here at DownTheTubes we issued a challenge to creators on our Forum to draw one of its most famous characters, Marvelman. While the response wasn't huge - we aren't a huge group and many of you are very busy people! - our Marvelman Challenge 2012 did garner some terrific entries, from artists including Keith Page, John Peter Britton and others. However, after much agonising, I came down to two entries - one by Andrea Motta, whose art offers a very singular vision of the hero, and Paul McCaffrey, who took a more traditional but dramatic approach to the character. After mulling over the different approaches, I've decided to decalre Paul the 'winner' of the Challenge, but it was a very close thing. • Any thoughts on what our next challenge should be? Drop me a line via the DownThe Tubes Forum. 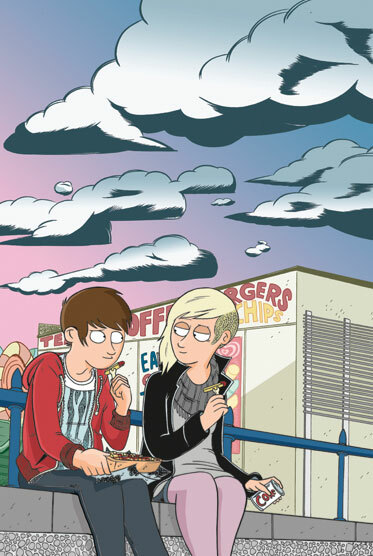 As part of the Panel Borders radio show's month of episodes on British comics, they're having their twice yearly look at a pair of young graphic novelists this weekend. Warwick Johnson Cadwell has garnered a great reputation for his small press work and contributions to short story collections, and Dickon Harris talks to him about his first graphic novel, Gungle, to be published in the near future by Blank Slate Books. Also, Alex Fitch talks to artist Jennie Gyllblad who, following a number of web comics and self-published collaborations with writer Corey Brotherson, has just finished The Arrival, the first of a three volume steam-punk graphic novel series Clockwork Watch curated by film-maker Yomi Ayeni. Just launched is a new indie UK publisher, Great Beast, described as "the home of the UK’s best independent comics and creators." The brainchild of creators Adam Cadwell and Marc Ellerby, Great Beast aims to provide the most fun and creative stories to as wide an audience as possible. All of their titles will be creator owned and professionally self published. The fledgling publisher launches with two collections of successful self published and award nominated comics to Great Beast; Marc Ellerby's Chloe Noonan: Monster Hunter series, and the vampire slacker series Blood Blokes by Adam Cadwell. Both creators will also be publishing long-awaited collections of their previous web-comic work, Ellerbisms and The Everyday, later in the year. May 5th is the annual Free Comic Book Day and many comic creators are banding together not only to promote their books but also support charities. Simon Furman, Andrew Wildman, Stephen Baskerville, Jason Cardy and JP Bove, the Transformers ReGeneration One team will be signing at Orbital Comics in Great Newport Street, London on the day, where you'll be able to get your free copy of the comic, get it signed and make a donation to trasnform the life of a child less fortunate than yourself. All proceeds from this upcoming event will be going to Make-A-Wish Foundation UK, the leading wishgranting charity that grants magical wishes to children and young people fighting life-threatening conditions. signatures at signing events in the UK raise a minimum of £1 per signature in aid of charity. "Comic Book creative teams generally do not charge for signatures and it seems like the perfect opportunity for comic book fans and readers to express their support for those children who do not have the opportunities that many of us take for granted," explained DwT's Andrew Wildman. "This simple exchange between the professionals of the comic book world and their fans will help fund the amazing work undertaken by Make-A-Wish." The Oribital Comics even, coinciding with Free Comic Book Day, will be the first event to implement this sceheme, but Andrew is hoping other comic creators will take up the challenge to raise money. Artist and writer Stephen White, also known as Stref', has announced a crowd funding initiative to get his latest project, a full colour 96 page graphic novel of JM Barrie's Peter Pan, off the ground. 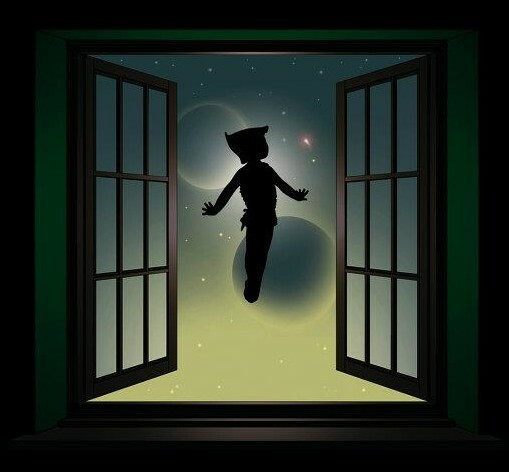 "To me, Peter Pan is the greatest story in the world, and one I have been hooked on (no pun intended!) since I was a small boy," says Stephen. "I intend the adaptation to be as faithful as possible to the original vision of the author, which is darker in tone than the Disney version that the majority of the world is familiar with. It will also contain scenes from the book that were not included in Disney's version! Adapting this book is my greatest ambition, and something I have been working towards for many, many years. This character is loved by people all over the world, and I understand the responsibility I would have to do this book properly." Stephen White has been a producing work professionally for over 25 years, including 7 years on The Dandy and The Beano. He has also created the graphic anthology Milk+, originally published in hardback by Insomnia and now available as a softcover, Raising Amy, a collection of newspaper style cartoon strip published by Markosia, and the mature readers graphic novel X, which is just about to be released independently. Peter Pan is the next project that he plans to work on. JM Barrie left all the rights for Peter Pan to London's Great Ormond Street Hospital For Children (GOSH) and, having already approached GOSH, Stephen intends the hospital to benefit from a percentage of sales of the book. Stephen says, "I intend a classic visual style for the book, that will make it timeless. The adapted script is already written and has been read by several other professionals, including Great Ormond Street Hospital Children's Charity, and former editor of The Dandy, Morris Heggie, who has over forty years' experience. I have many professional colleagues at hand for expert advice and support with all aspects of, and through all stages of, this project." Stephen is looking to raise $32000 via Indiegogo crowd funding to fund the creation of the book over the course of one year and is offering a variety of incentives for backers from signed art prints and signed books via original artwork from the book up to opportunities for "walk-on" parts in the artwork as pirates or lost boys and even one "speaking" part. 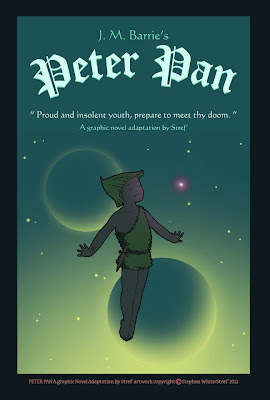 There are more details of Stephen White's plans for his Peter Pan graphic novel on the Indiegogo website and on the project's Facebook page including a selection of character designs, concept art and dummy covers. Stephen White organises Reekie Roundup, the Edinburgh comic creators group. Meetings take place on the last Thursday of each month in Mathers Bar in Edinburgh's Broughton Street. There are more details about Reekie Roundup and the date and time of the next meeting on the group's Facebook page. I don't know, you don't have a comics gathering to go to and then three come along at once. In addition to the long-announced Bristol International Comic Expo (12th-13th May) and Kapow (19th-20th) in London next month, we've just had word that the BD and Comics Passion Festival is back between 24th - 27th May. This is the second festival organised by London's L’Insitiut Francais in association with Comica Festival, it's intended for fans of comic books, graphic novels and bandes dessinées. The festival features a terrific line-up of extraordinary creators (Christophe Arleston and Jean-Louis Mourier, David B., Guy Delisle, Karrie Fransman, Tom Gauld, Pat Mills, Kevin O’Neill, Luke Pearson, Grzegorz Rosinski, Jonathan Ross), music (Mesparrow), performances (Freeeks Factory), films and the best booksellers (Gosh!, La Page, Cinebook). With nearly thirty events including live drawing, talks, exhibitions, workshops, a drawing jam with Mesparrow and a dress-up party, the team behind it say this innovative festival will have something for everyone. "We've been working really hard over the last few months to give Londoners L’Insitiut Francais’ second comics book festival and have managed to get our hands on some real treats," Angela Sangma Francis told downthtubes. "We’re also still trying to spread the word to all that may want to join in, from the comic curious to die hard fans, so if you think it's something to write home about... then please do!" In addition to the official web site (www.bdandcomicspassion.co.uk) there’s also a Facebook page for the Festival. (via Mark Beer): Illustrator and comic artist Mark Beer has dropped us a line to tell us he's collaborating on a digital zombie comic that will be promoted with a 'Zombie Walk' at the end of this month. Written by Dean Mitchell with art from Graham Williamson and Renzo Rodriquez, Killer B*****s of the Zombie Holocaust is a road trip following Laura and Sarah as they battle through a game controlled by a group of people inside 'The Dome'. Contestants have to battle through a city to find a suitcase that has two tickets out, and will gain you entry into the 'The Dome'. "Who the people are within 'the Dome' is unknown and the technology they have is different to anything we have seen before, all we do know is that the winning contestants are to be used for a war that is starting," says Dean. Inspired by the likes of Planet Terror, Battle Royal, Lost and even the game Mass Effect, Killer B*****s of the Zombie Holocaust is a story about two incredible girls and their fight for survival in a game unlike anything else and a truth that is as unique as the title of the series! Mark Beer is drawing covers for the comic, which is to be distributed online via Facebook, Twitter and a website currently being created. "The comic is also interacting with readers like never before," adds Dean. "The girls take photos during the episodes that are then drawn and uploaded to twitter, before each episode readers can vote on what they want the photos to be of, and then this will actually be written into the comic." Another interactive feature is competitions with prizes like becoming a character, this has happened already in a mini episode and it proved massively popular. The comic is planned to be released 26th April 2012 alongside an organised zombie walk on Southbank, London, planned as a massive publicity stunt. Glasgow based Rough Cut Comics have impressed before with their vampiric Rose Black and Rose Black: Demon Seed graphic novels. As part of the publicity for Rose Black, the company used British model Amanda Swan to portray the character of Rose but they soon realised that there was the possibility of basing a comic around the model herself. Amanda Swan: The Hellfire Legacy re-imagines her as a reality show IT girl by day and a leather-clad motorbike riding vigilante by night - a 2012 vigilante who has a strange connection with the Hellfire Club of 1858 London. Written by Ed Murphy and Tom Campbell with art by Joel Carpenter and colours by Derek Dow, the same team as Rose Black: Demon Seed, Amanda Swan: The Hellfire Legacy is a 32 page prestige format, full colour comic and is currently only available from Amanda Swan's own website for a cover price of £4.99. 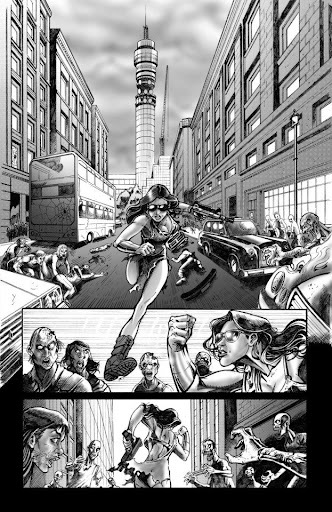 The title will be released to shops on May 2012 when the creative team and Amanda Swan herself will be appearing at the Kapow comics convention in London's Business Design Centre. There are more details of Amanda Swan : The Hellfire Legacy on the Rough Cut Comics Facebook page and blog and the title can be bought directly from the official Amanda Swan website shop. Amanda Swan and Rose Black writer Ed Murphy will be appearing at at the Graphic Novel Night at Meadowbank Library in Polmont near Falkirk on Saturday 21 April 2012. There are more details of the event on the library website. Wired, the first title from new small press publisher Emancipation Studios is now available from their website. Based in West Lothian near Edinburgh, Emancipation is the brainchild of writer James Lundy who describes himself as a "lifelong fanboy". 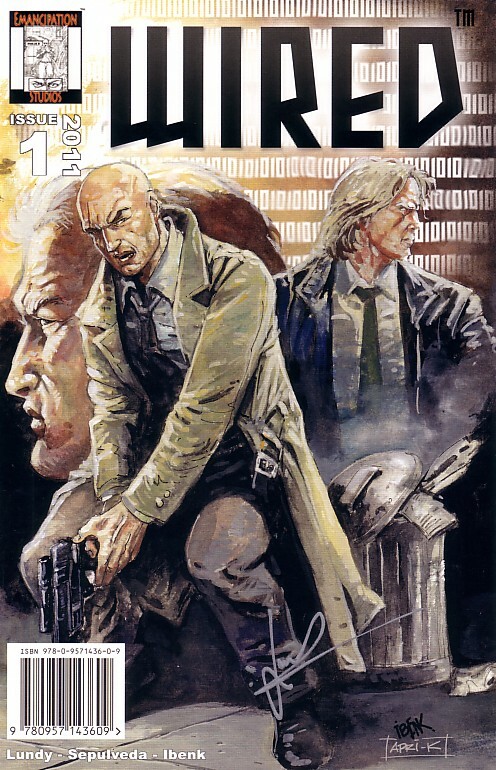 Wired is described as a noir sci-fi/horror story set in a world where things are usually what they appear to be as two detectives, Briggs and Smith, investigate a case that leads them to a West Lothian industrial estate. Written by James Lundy, the 28 page US sized comic features a colour cover by B Ibenk and Apri-K with black and white internal artwork by penciller C Sepulveda and inks by B Ibenk. There are more details about Wired on the Emancipation Studios website and their Facebook page. Writer James Lundy will have copies of Wired Issue 1 at the Graphic Novel Night at Meadowbank Library in Polmont near Falkirk on Saturday 21 April 2012. There are more details of the event on the library website.